We live in South Eastern Arizona, in the desert. Our soil is alkaline (sandy). Will composting help the pH level? We always add soil conditioner any time we plant. Because the water just runs right through, we water only the trees and large shrubs deeply. The others are watered very often. I have hydrangea and other plants in pots. The leaves of these plants keep turning yellow with dark green veins. I feed these pot plants acid fertilizer one half strength on a regular basis. Will compost help these potted plants too? Compost is a great answer for lowering soil pH. It doesn't exactly lower soil pH, what it does is buffer the pH making the soil function as if it had a lower pH. Compost can effectively move your pH down a point without having any negative effect on the living soil community. It's interesting that you are growing a hydrangea in one of your pots. Hydrangeas are a natural pH indicator. If you have blue hydrangeas you have acidic soil. If they are pink you have alkaline soil. Here are a couple of pictures showing a pink and a blue hydrangea. 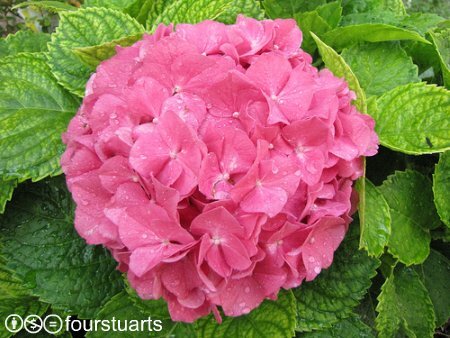 In the this photo of the pink hydrangea if you look closely at the leaves you can see they are somewhat yellow with dark green veins. Yellow leaves with dark green veins are showing classic symptoms of iron deficiency or iron chlorosis. This is common with plants growing in alkaline soil as at high pH values iron tends to become insoluble and therefore not available to plants. We know the soil pH is alkaline as the flower is pink. In this photo the plant has dark green leaves. The veins are even a little lighter in color. This plant is able to access enough iron as soil conditions are somewhat acidic. 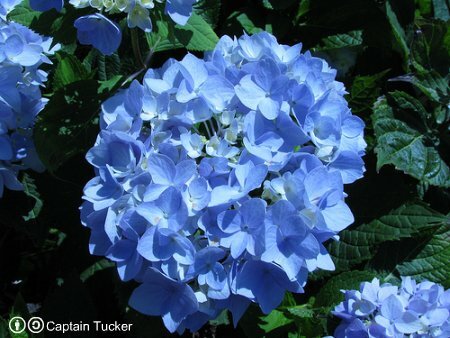 We know this because this hydrangea flower is blue. Yellow leaves with dark green veins is an indicator of an iron deficiency or iron chlorosis. Given that you have alkaline soil, your yellow leaves are likely caused by the soil pH rather than an actual deficiency of iron. In alkaline conditions the iron becomes insoluble so the plants can't access it. Adding iron won't necessarily help, but if you want to try that make sure it is a chelated iron amendment. The chelated iron fertilizer has less chance of binding with other elements such as calcium and becoming unavailable to your plants. For a total biological approach to lowering soil pH follow these two steps. Add compost. In your containers make your soil mix about a third compost. In other areas, if possible, amend your soil with 2-4 inches of compost every year. If you have earthworms you can just put the compost on top of the soil and the worms will dig it in for you. Make some channels that reach down to the roots of your hydrangea. Sprinkle endo-mycorrhizal fungi spores onto the roots. I would be tempted to stop with the acidic fertilizer especially if it has phosphorus in it as added phosphorus tends to discourage the fungi. I figure they start wondering "what do you need us for". These fungi use various enzymes to make iron and phosphorus available to plants in a form they can use. See the phosphorus fertilizer page for more info. Compost buffer soil pH thereby raising or lowering soil pH. In the sandy desert soil it will improve water holding capacity by at least ten fold. Makes a great habitat for the complex soil community that Nature has to manage your soil whatever its problems. Liz mentioned that she was feeding her plants a half strength acid fertilizer. What I think might be happening is that the water is so alkaline the fertilizer is neutralized or possibly even made alkaline. On the farm I used to have our river water, which was our irrigation supply, had a pH of close to 8. Check the pH of your water - it may be making that acid fertilizer alkaline. Use lots of compost as your soil conditioner. Look to soil biology, such as mycorrhizal fungi for the biggest part of your answer for both your regular soil and your containers.